Social media has spawned a lot of flaky trends, but the so-called “Tide Pod Challenge” certainly ranks as one of the most bizarre. News reports that large numbers of teenagers have been daring one another to eat the popular laundry detergent packets (and post videos of themselves doing so) has prompted alarm and mystification among both parents and health officials alike. Is the Tide Pod Challenge for real? Many people believe the fad is exaggerated and something of a hoax, but there also been a number of deaths and hospitalizations. What exactly is behind this strange craze? Here are some things you need to be aware of. In the first half of January, poison control centers in the United States handled 39 cases of intentional Tide Pod ingestion. Many digital users are attracting widespread attention by doctoring product photos, concocting fake recipes and showing foods supposedly made with Tide laundry pods (see below). Virtually all of these appear to be intended to be humorous. However, public health officials remain deeply concerned about the whole fad. Last year, poison control centers reported that they received 10,571 claims of children five years or younger that had some sort of adverse exposure incident with the pods. 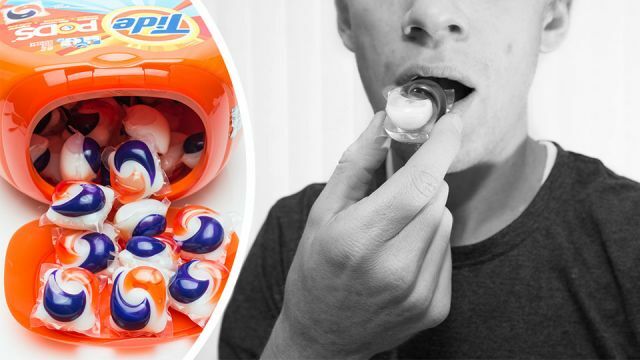 According to Dr. Diane Calello, at the New Jersey Poison Information and Education System at the Rutgers New Jersey Medical School, “This is not something I would put anywhere near someone’s mouth.” As she explains, the chemicals in the laundry pods contain chemicals that can cause severe burns to the mouth, the esophagus, the stomach and the respiratory tract. To get the word out about the dangers of consuming the Tide Pods, New England Patriot tight end, Rob Gronkowski, recorded a video discouraging the practice, which has garnered almost eight million views. How did this craze get started? Almost immediately, health concerns began to mount as a number of young children began inadvertently biting into them because they mistakenly believed the pods were candy. Within a matter of months, consumer safety agencies felt compelled to alert families to the dangers these products could cause if misused. The hazards of kids eating detergent pods hardly seems like a laughing matter or the stuff for comedic fodder. But 2015, The Onion (a satirical online magazine) published a humorous op-ed, supposedly from the perspective of a toddler, in which the author promised to eat those “multi-colored detergent pods.” No one can really say if this article played a role in the development of the current craze. Between 2012 and 2017 (before the current Tide Pod Challenge took off) the dissolvable liquid laundry detergent product was linked to ten deaths. In a recent development, a female Utah State University student was hospitalized after ingesting a Tide Pod over the weekend. In the event of an emergency or toxicity concerns, the American Association of Poison Control Centers has a hotline, 1-800-222-1222. The agency’s experts are on hand to answer your questions. You can also text “poison” to 797979. Hey Buddy!, I found this information for you: "Teenagers Are Eating Tide Pods And Posting Reactions Online. Here’s Why". Here is the website link: https://www.thealternativedaily.com/teenagers-eating-tide-pods-posting-reactions-online/. Thank you.